Who’s Afraid of the Dark? | American University Washington D.C.
You are here: American University Media Relations News Who’s Afraid of the Dark? 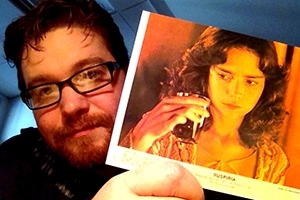 Kyle Brannon with a lobby card from the 1977 film Suspiria. It was a gift from a student in his European cinema class. "I heard many things in hell. How, then, am I mad? Hearken! and observe how healthily—how calmly I can tell you the whole story." -Edgar Allan Poe, "The Tell-Tale Heart"
You might watch people holed up in a farmhouse to evade marauding ghouls. Maybe you'll revisit the madman frenetically chasing his family around an empty Colorado hotel. Or view an alien bursting right out of a man's chest. And when this type of thing happens on screen, what do we call it? A fun popcorn movie! Americans have a longtime fascination with scary movies. And when you peruse your cable and Netflix listings, you'll notice an increasing number of fear-inducing TV shows. Is there a sadistic force enveloping the American psyche? Halloween is here, and School of Communication Assistant Professor Kyle Brannon discusses the enduring popularity of the horror genre. Traditionally, horror taps into the desire to feed and indulge our fears, Brannon says. He suspects that the recent success of dread TV reflects societal anxieties. "I do think that there's a bit of a need for a release because the past decade and a half has been so communally stressful—between recessions, wars, terrorist attacks," he says. "We all have to kind of purge stuff when it's in our brains, somehow." Brannon remembers those morality tales in 1970s and 1980s films, but he notices that this is changing. "I see a trend of downer endings where the bad guy doesn't get his comeuppance, or maybe the good guy doesn't walk away completely fine," he says. "Not to analyze society too much, but I think that's because there's a lot of moral questioning going on in our world right now…So what do you have to do to be good in a horror film?" Horror in storytelling is actually quite old. Lest we forget, when Oedipus realized he'd married his mother, he gouged out his own eyes. Now, Brannon says, each successful film or TV show creates a community response. "If the reaction is bigger, of course, it makes more money. Then somebody else goes, 'Oh, people really love zombies, I never thought of it. Let's do zombie films now.' And it becomes a trend." TV is being taken pretty seriously nowadays, with scores of websites analyzing shows from every angle, plot line, and double meaning. And during this golden age of TV, horror is omnipresent: The Walking Dead, American Horror Story, Hannibal, Bates Motel, True Detective, The Strain, Penny Dreadful, to name a few. "It really seems to have blown up in recent years. And it's interesting how it's tiered. You'll get shows that are basically biting off what a horror genre is, like The Vampire Diaries. Or shows doing it the way True Blood does it, which is closer to horror, even though it's very soap opera-y," Brannon says. Brannon's office displays an infographic charting monsters in the movies and a poster of the Swedish vampire drama Let the Right One In. The genre certainly inspires dedicated fan bases. "The people who are really into it usually have memorabilia and decorations and know every line," he says. Yet it's fragmented. Some people like creepy ghost films, while others prefer slasher flicks. You've got something for everybody, and talented Hollywood directors have pushed the boundaries of horror in cinema. Steven Spielberg unleashed a terrifying shark in Jaws, and Ridley Scott brought nightmares into space with Alien. With the latter, Brannon explains how horror often has a relationship with pop culture of the moment. "They wanted Alien to be a horror sci fi film that was the exact opposite feeling from the audience that you get in Star Wars," he says. Innovations in technology add new intrigue to old tales. "Somebody learns from a master, and then a new technology comes out, and they create even more awesome monsters or werewolves or aliens," he says. "A CGI Godzilla has a whole different feel than a rubber suit Godzilla." There's also a low-budget tradition in horror, Brannon says. "It doesn't have to cost you millions of dollars," he says. "It's really useful for filmmakers, makeup artists, cinematographers. Working in horror, they can trip through their craft and learn, and still have people watch it and enjoy it for what it is." Early in his career director Sam Raimi made The Evil Dead, an inexpensive cult classic, before eventually directing the blockbuster Spider-Man trilogy. At American University's SOC, Brannon is a full-time professor of film and media arts. He loves teaching, and he's constantly exploring new programs and emerging media. Along with professorial lecturer Greg Smith, he co-hosts a web TV show shot by SOC and titled "Greatest Scene Ever." Each episode they talk about a specific genre or topic in film, and last year they did a "Funny Halloween Films" episode. He's also considering a couple ideas for a web-based horror series. Though sometimes relegated to B movie status, horror is getting much more respect these days from academics, Brannon says. He incorporates some horror into his European cinema class. "If you hold your nose up too much to the 'Top Ten Films Ever Made' and all that, then you're not opening yourself up to what a film can do."